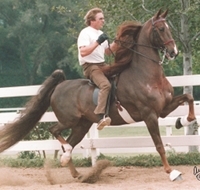 Most breakaway halters are constructed so that the crownpiece, the part that goes behind a horse’s ears over the poll area, is thin, cheap leather. The rest of the halter looks like a flat nylon halter, except there’s usually a snap on the left side—the kind you have to flatten with your finger, not the usual kind with a spring in it that you lower with your thumb. Exert enough pressure on the halter, and the leather will break. Instead of buying a whole new halter, all you do is buy a piece of cheap leather of the same dimensions from a shoemaker or tack repair shop. My experience with these halters is limited to Gunsmoke, and he’s had four different ones. He’s a very busy horse—always curious, always investigating—typical behavior for a stallion, and the day I officially rescued him, he was a stallion. Since the vet was coming to geld him the following day, John and I decided to leave a breakaway halter on him overnight, since he hadn’t been handled a lot in the three years he had spent with an absentee owner. When we walked up to feed that morning, there was Gunsmoke—no halter. We searched everywhere, and finally found it beside one of the fence panels. He had obviously caught it on something and pulled back to free himself. But the leather was intact. One of the metal parts had broken. The reason most horses shouldn’t wear a halter all the time because eventually they’ll do what Gunsmoke did and catch it on something—and hurt themselves trying to pull free. If your horse wears one for safety reasons, make sure it fits his face. Most don’t, and unless you loosen them or tighten them every day, the halter can rub his hair out or cause sore spots on his face. Once I began having problems with Gunner nipping, we left a breakaway halter on him. One morning when I went to feed, his halter was no place to be seen. When I found it—I’m still not sure what he caught it on—the leather had broken. About two weeks later when I came out to feed, Gunner he was standing perfectly still—not usual for him—right next to the front of his corral, parallel to the fence. Normally he’s very interested in how fast I can get hay into his feeder and will approach me as soon as he sees me. This time he didn’t move. Although he didn’t have the rigid stance of a horse with tetanus (and he’d had all his shots), I was afraid he’d hurt himself. 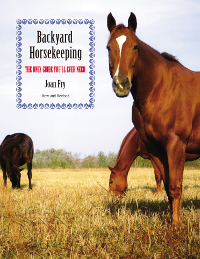 As went inside and I approached his head, I saw that he had caught the snap—the kind you press down on—on a piece of unconnected stud wire, probably the only one in his entire corral. Thankfully he hadn’t panicked, because he could he could have done a lot of damage to himself and the corral if he had. Instead, he just stood there, waiting for somebody to free him. So I did. 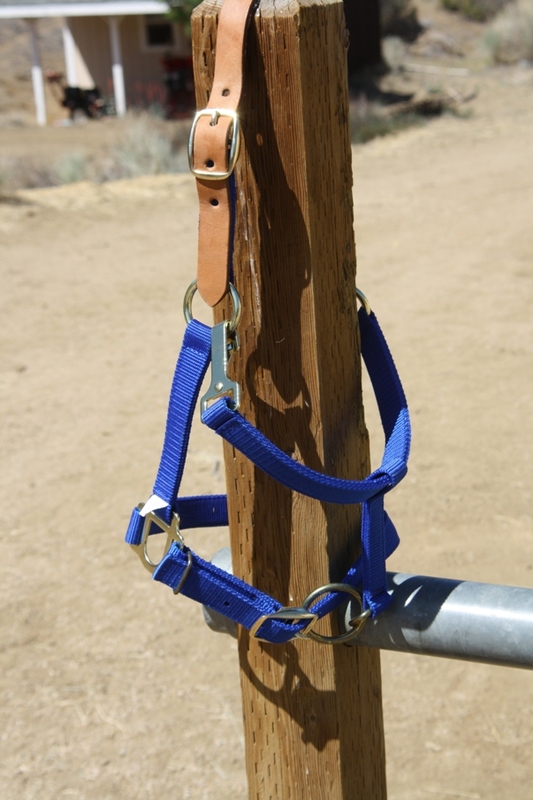 Some horses are going to get in trouble no matter what precautions you take. For the rest, a breakaway halter is good insurance. Yes. Very true! I remember when I was younger and a horse was leaving the barn on one of those huge semi-truck trailers, reared up, and the halter got stuck on some part of the trailer. They couldn’t detach it in time (no breakaway halter), and he ended up breaking something on his head/neck, and was euthanized. All halters were immediately replaced with ones that were much safer. Yes, breakaway halters are the way to go. Sad story–but sometimes that’s how we learn.